Where are you from? Your professions? Quincy, Florida, which is just west of Tallahassee. Marylyn: retired fee-only certified financial planner and registered investment adviser. Ed: retired public service; Secretary, Department of Children & Families & Health and Rehabilitative Services. When and how did you become interested in paddling? When we realized that having our own kayaks was more fun than a tandem canoe in 2011. Where is your favorite place to paddle? October-May: In Florida on Womack Creek in Tate’s Hell State Forest, a tributary of the Ochlockonee River and Fort Gadsden Creek in the Apalachicola National Forest, a tributary of Apalachicola River. June-September: Canadian Rockies, Southwest Alberta, Canada: Cameron Lake, Waterton Lakes National Park (northern extension of Glacier National Park), Alberta. We’ve paddled 31 states (including Hawaii) and three Canadian provinces. Hope to paddle 50 states and all Canadian provinces. Our favorite paddles: Upper Missouri from Coalbanks to Judith Landing, MT; Brule River, WI; Jack’s Fork, MO; Colorado River’s Black Canyon, from base of Hoover Dam, NV. What is the most interesting thing that ever happened to you on a paddling trip? Caught in high winds on Lake Kabetogama in Voyageurs National Park, one of us imagined the headlines: “(Stupid) Paddlers Drown in Lake Storm.” We had skirts, dry suits, and kayaks which rode the waves, but had had no experience in waves that deep with turbulent cross waves. We literally surfed from one side of the lake to the other; except having fun surfing was the last thought on our minds. 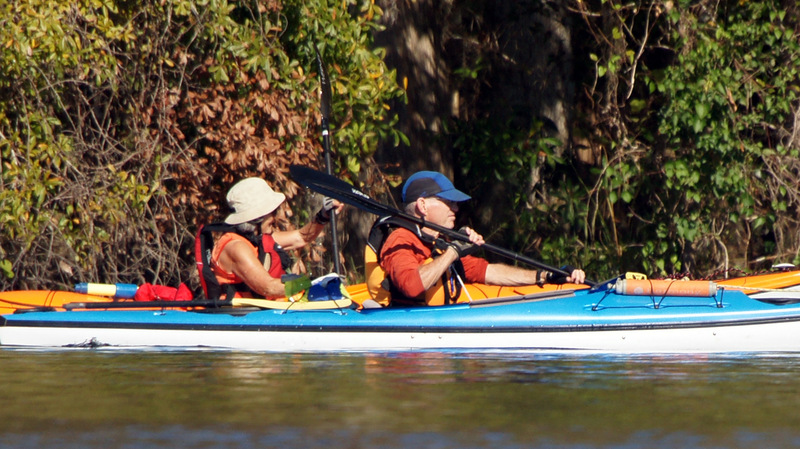 How many Paddle Florida trips have you gone on and to where? Two. The Withlacoochee and the Bartram History Paddle on the St. Johns River. What keeps you coming back? We’re always looking for areas to paddle where development has not ruined the natural world. Paddle Florida’s trip format of tent camping and paddling, its emphasis on environmental stewardship, and that paddlers are not coddled – we’re expected to be able to handle whatever nature and the venue dishes out. Can you describe a Paddle Florida trip highlight? On most recent maiden and, alas, only St. Johns Bartram Trail paddle, camping on Dunn’s Creek at soon-to-be-opened Dunn’s Creek State Park. The sunset was glorious, reflecting on the creek which was dotted with roosting egrets. Florida at its best! Also the enthusiasm and knowledge of trip volunteers Sam and Dean who explained history and high points of Bartram Trail. What advice do you have for folks considering a Paddle Florida trip? Study the map of the location to orient yourself on the paddling conditions; make sure your boat is suitable for that venue; expect the unexpected. The challenges will be what you will remember.